"The directors behind the Springfield Museums intend to launch a new cultural institution in honor of Theodor Seuss Geisel. An opening date for the permanent exhibition (first floor) of the “The Amazing World of Dr. Seuss Museum” has been set for June 2016. 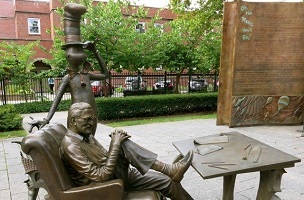 The second floor area will showcase “a re-creation of Ted Geisel’s studio, an exhibition about the making of the Dr. Seuss National Memorial Sculpture Garden and other related displays.” It will not be made available to the public until 2017." I am so excited about this! What a fabulous idea. Who didn't grow up with Dr. Seuss? Wouldn't it be so fun to see his stories and characters come to life in this way? I would so love to take my kids to this museum someday. Seriously, I could not be more on board with this idea. More bookish museums, please, world! ROAD TRIP!! This is awesome! Seriously! Next time I'm in Massachusetts, I am so there.